Barça did it … and boy did they do it! If you are going to win a trophy, then that 's the way to do it. What we have just witnessed will go down as one of THE great cup final displays of all time, not just in the Copa del Rey but in any cup competition anywhere on the planet. From start to finish there was only one team it as they scored one, two, three, four, five goals – equalling the highest ever winning margin in a Spanish Cup final and also becoming the first team in 85 years to complete an incredible run of FOUR consecutive victories in the tournament. 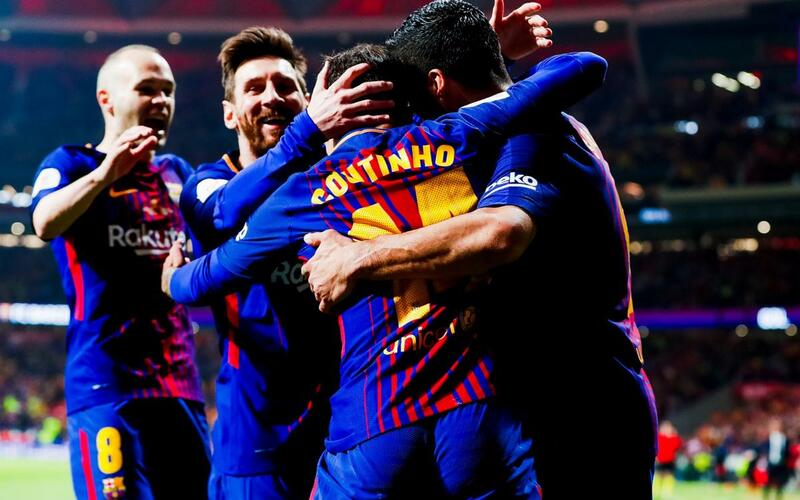 And it takes what was already a record haul of Spanish Cup trophies to a mightily impressive thirty – and with the club’s eighth league and cup double now within touching distance there are plenty of reasons for Barça supporters around the world to feel very, very happy indeed right now. There have been some incredible Barça performances in recent years, but this was one of the best of all. There were red and blue shirts troubling the Sevilla defence right from the start and it came as no surprise to see them taking the lead after 13 minutes. Luis Suárez got the final touch, but the goal was really about Jasper Cillessen. The Dutch keeper spotted space in front of Philippe Coutinho and delivered the most gargantuan of long balls into his path. The Brazilian skipped forward and all Suárez had to do was tap in the assist. Little more than spectators thus far, Sevilla did perk up following the goal, but Barça still looked by far the better side. Andrés Iniesta almost made it two, but his strike hit the bar. Not to worry … Moments later Leo Messi was equalling Telmo Zarra’s record of scoring in five different cup finals. Once again the magic was in the build-up. Iniesta and Jordi Alba displayed all their finest virtues in getting the ball into the kind of position where their Argentinian team-mate rarely fails. And it didn’t stop there. Luis Suárez had never scored in a cup final before this game, but he was soon celebrating his second. A sweet one-two with Messi and a confident finish to beat David Soria and that was 3-0. There was still a whole 45 minutes of football to be played, but the contrasting atmosphere at the two ends of the Wanda Metropolitano said it all. This final already had a winner. Any doubts about that were soon laid to waste a few minutes after the restart. And there could not have been a more popular goalscorer than Iniesta. A terrific run, some help along the way from Messi, and a wonderful finish from a tight angle had the Barça fans chanting the name of their captain. There were Sevilla fans that couldn’t resist joining in too – and the whole stadium, whatever colours they were wearing, were on their feet when Iniesta was substituted later on in the game. Sevilla were broken, Barça were showboating and the only unanswered question was how many more blaugrana goals we were going to enjoy. On 69 minutes, Coutinho made it five. That one didn’t count because the referee had already blown a penalty for handball. Fittingly, the Brazilian was invited to take the kick and made no mistake from the spot. Now it really was five. Interest in the game started waning among the Barça fans. Instead, attentions were turned to something they’ve had ample practice at in recent years – celebrating. And those celebrations, in Madrid, in Barcelona, and all around the world, are sure to carry on for many hours into the night. And with very, very good reason. Força Barça!